Have you wondered why anyone would embrace year-round homeschooling? Has the idea intrigued you, but you aren’t quite sure if you should try it? Over the last several years, we have realized that we do best with year-round homeschooling. It works well for us for several reasons. Here are 5 reasons you should consider year-round homeschooling. Since you have a 12-month school year, you are granted extra time to work through each grade level. Most homeschool curriculum programs have 34-36 weeks of lessons. Since you have 52 weeks to do school, you are able to work through the lessons at your own pace. For us, we school January through December, with a long break from formal seat work planned from Thanksgiving week through New Year’s Day. However, we are often doing special projects related to the Holidays, so learning continues. With the entire calendar year to use as you wish, you can choose to shorten your school week. Having a 4-day school week can free up a day for errands, field trips, or as a catch up day. It can do wonders having that extra weekday to get household chores done and prepare yourself for a great week free from distractions. We do school Tuesday through Friday. Monday is my day to clean and organize the house after the weekend and the kids get extra “free time“. It gives us a boost before starting our school week. 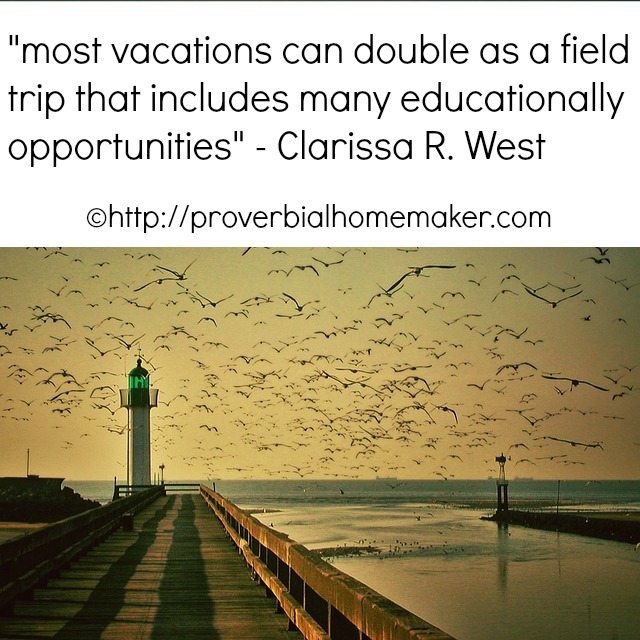 Probably one of the more popular reasons some choose to do year-round homeschooling, is so that they can take advantage of the off-season for family traveling and vacations. Spring and autumn are often the most travel-friendly when it comes to weather in the U.S. The best hotel rates are often between September (after Labor Day) and May (before Memorial Day Weekend). National Parks are great places to explore during the off-season and you will find that wildlife is most active in spring and autumn, as well. Year-round homeschooling gives you the freedom to vacation in autumn, winter, and/or spring without losing valuable school time. Of course, most vacations can double as a field trip that includes many educational opportunities. Notebooking or journaling is a great way to capture those educational moments. Year-round homeschooling is extremely beneficial for when medical emergencies or family crisis’ arise. If you remove the mentality that you must stop schoolwork for all of summer, you can stop stressing about schoolwork when an emergency happens. Knowing that you can simply get back to schoolwork when the dust settles and not miss a beat, is one less thing to worry about during a difficult time. 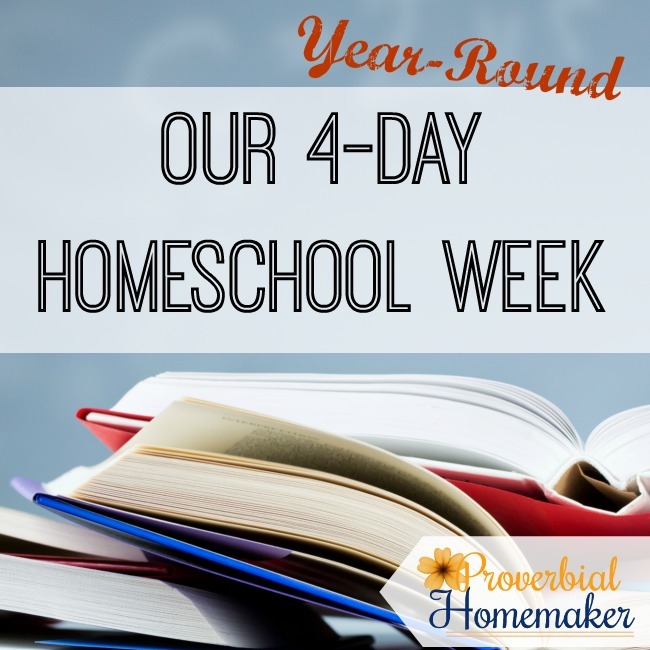 If you need 34 weeks to complete your homeschool curriculum, that means you have 18 “extra” weeks throughout the year to use as catch up weeks or to use as homeschool breaks! Claiming all 52 weeks as part of your homeschool year, really takes a burden off of your shoulders. Instead of wasting the hot summer afternoons, use them for schoolwork! Often summer afternoons are too hot to really enjoy and we are sitting inside in the air conditioning, so why not put that time to good use? For us, school in the summer is no different than any other time of the year. Though, we can choose to take time off and even go on a vacation in the summer, because we have plenty of wiggle room in our school year. I know that others choose to do a lighter workload during the summer months, but still do some form of school. 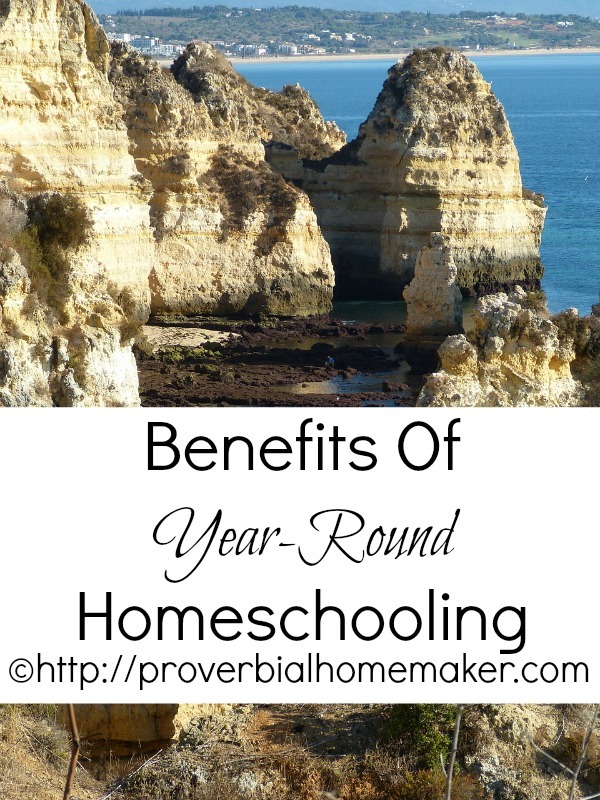 Year-round homeschooling gives my family a lot of freedom to use time to most benefit us! If you homeschool, do you follow the public school schedule or make your own? What works for your family?